In a large sauté pan, brown Italian sausage. Drain, remove from pan and set aside. In the same pan, add onion and pepperoni; sauté for 5-7 minutes. Add browned sausage and pizza sauce to the pan; sauté for 3-4 minutes. Transfer mixture to a bowl and cool. Fold in ½ cup mozzarella. Roll pizza dough out into four 4x12-inch strips. Cut each strip crosswise into four 3-inch sections. Spoon 1 teaspoon of filling to the top of each piece of dough, making sure to leave about half an inch surrounding the filling. 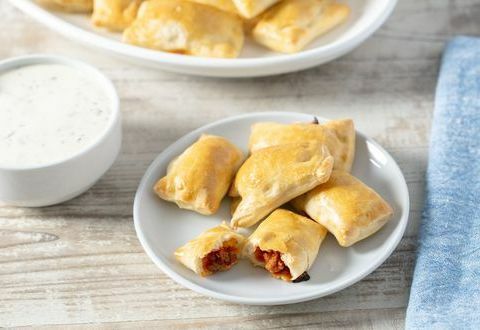 Fold the dough over to cover the filling, cut off the rest of the dough strip and press the seams together with your fingers to form a pizza roll. Repeat one more time with another teaspoon of filling, so you get two pizza rolls per strip of dough. Cut off any remaining dough outside the seams with a pizza cutter. Place pizza rolls on a baking sheet about ½ inch apart; brush lightly with egg wash.
Bake for 15 minutes, until lightly browned. Remove from oven and allow to cool for 5 minutes before eating.